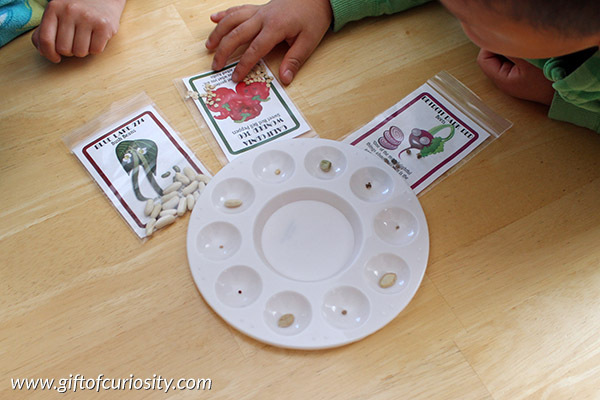 I am so excited to begin sharing all of the really fun activities we did last spring to learn about seeds! 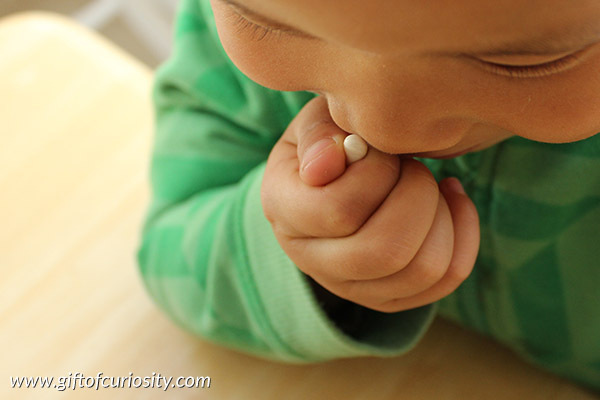 This post is the one of two I’ll be sharing about exploring seeds with preschoolers. One of the first activities we did during our seed unit was to spend some time closely observing different kinds seeds to learn more about them. 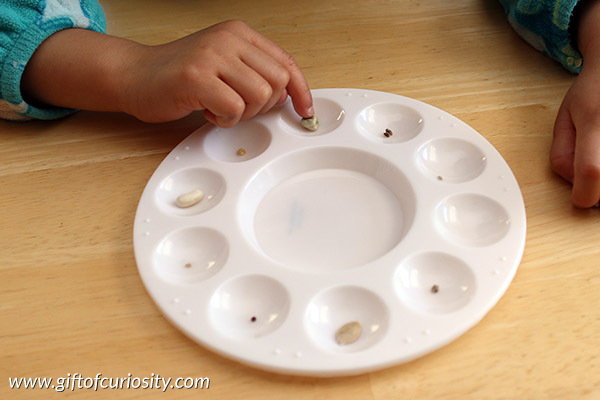 This is a perfect seed activity for preschoolers to work on their observation skills. 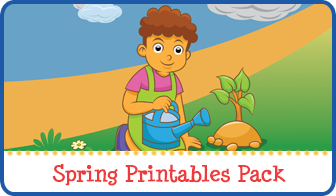 Note: For more seed activities your kids will love, see my Botany Unit Study page. 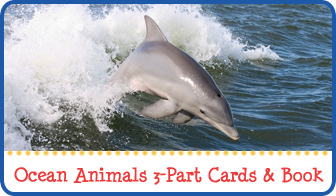 For this activity, I purchased 12 packs of vegetable seeds for us to use. One packet at a time, I handed a seed from each packet to my kids so they could observe it. We described the shape, size, and color of each seed. We even spent some time smelling the seeds. They didn’t have much of an odor though :-). 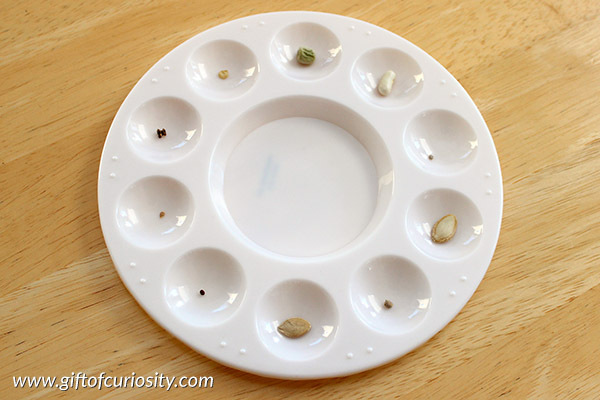 After observing each seed, we placed them into separate wells of a plastic paint palette. Once we had filled the wells of our plastic paint palette with seeds, we discussed how the seeds were alike and how they were different. There was quite a bit of diversity in the seeds, which was really fun to notice. Then we played a matching game. I handed my kids the packets and had them try to match each packet with the seeds in our plastic paint palette. Some of the packets were easy to match to a seed, but others were challenging because some of the seeds looked very similar to one another. Finally, we decided to see what other seeds we had around the house to see how they compared to the seeds we had just observed. 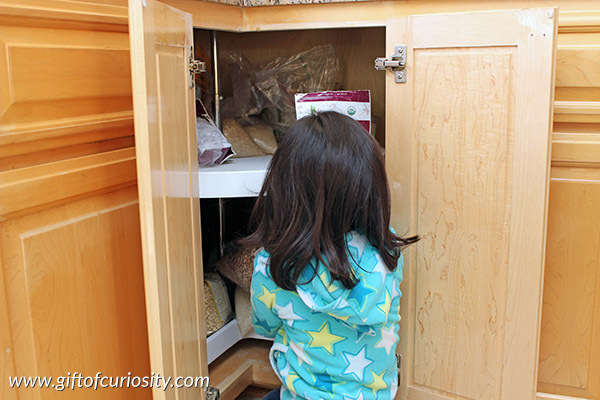 Because we had already read several books about seeds, my kids already knew what to look for. They went right into our cupboards and pantry to dig things out. 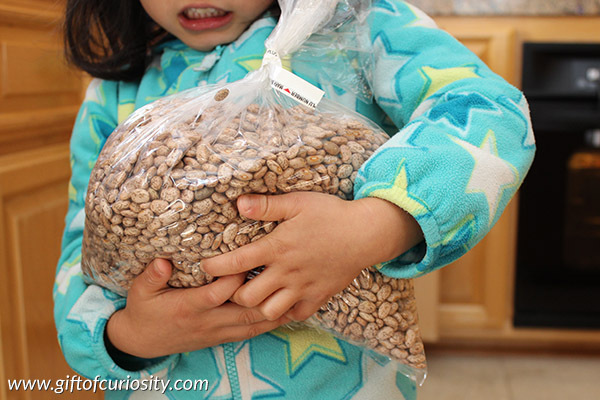 I was actually surprised at how many seeds we found in our home! I guess I had simply never taken the time to think about all the things we eat that are seeds. 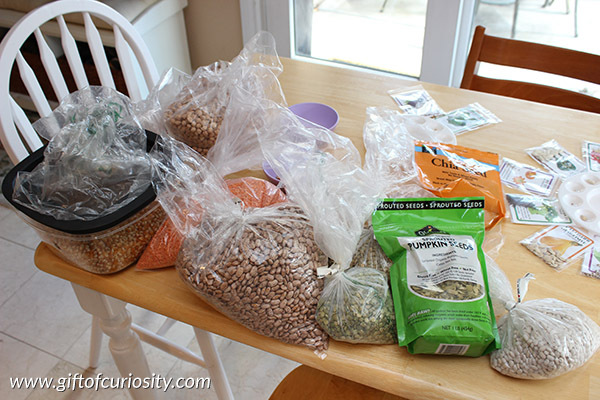 Among the items we found were several varieties of beans, lentils, split peas, pumpkin seeds, chia seeds, rice, and popcorn kernels. So many seeds! Experiment: Do seeds need light to grow? 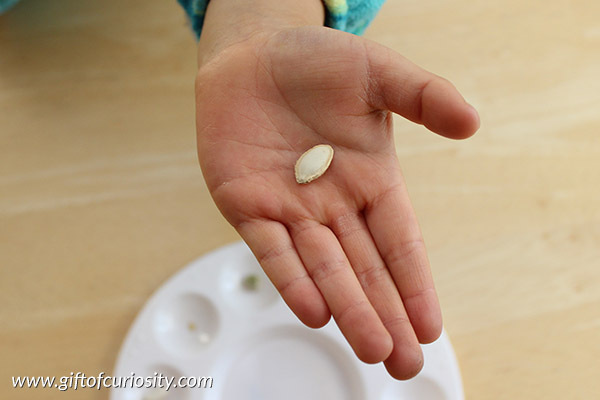 Experiment: What temperature do seeds like? Experiment: Do seeds need air? 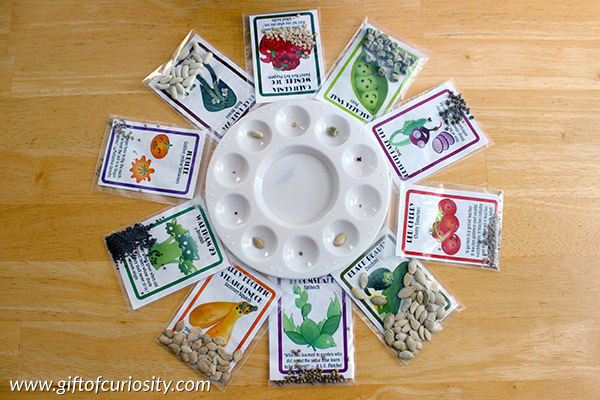 Experiment: Do seeds need their seed coat? Experiment: What liquids do seeds like? 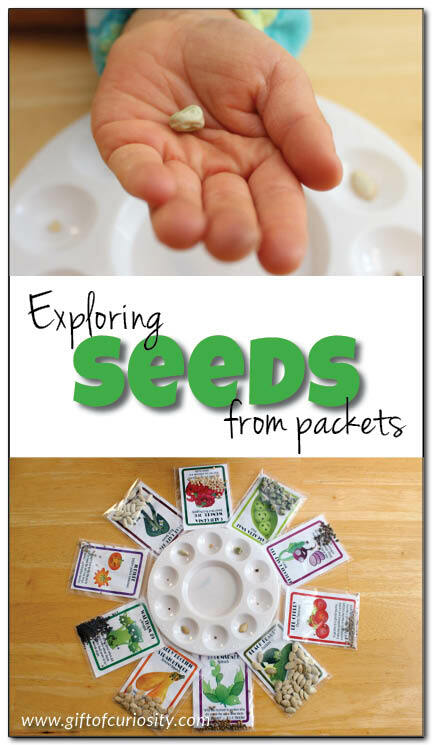 For more seed activities your kids will love, see my Botany Unit Study page and my Botany & Gardening Pinterest board. 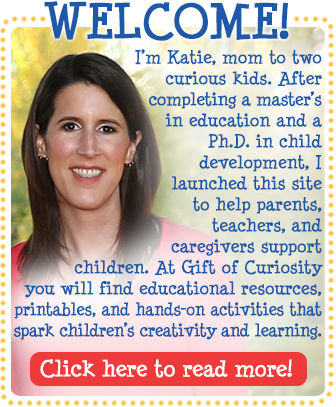 Follow Katie @ Gift of Curiosity’s board Unit Ideas: Botany & Gardening on Pinterest. 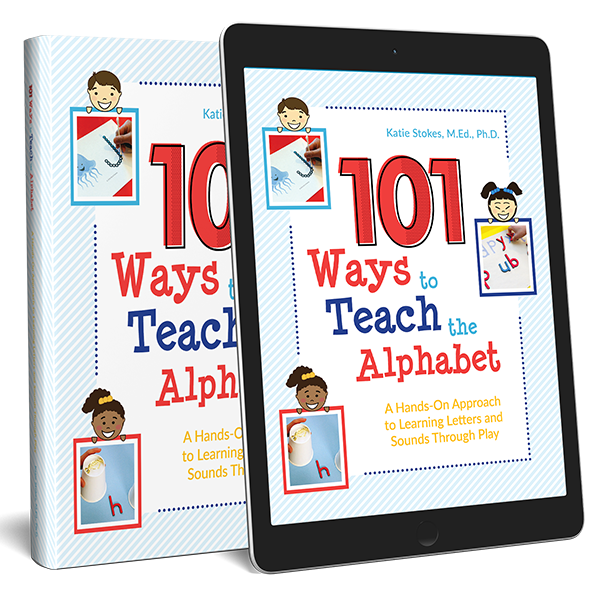 Another wonderful resource. 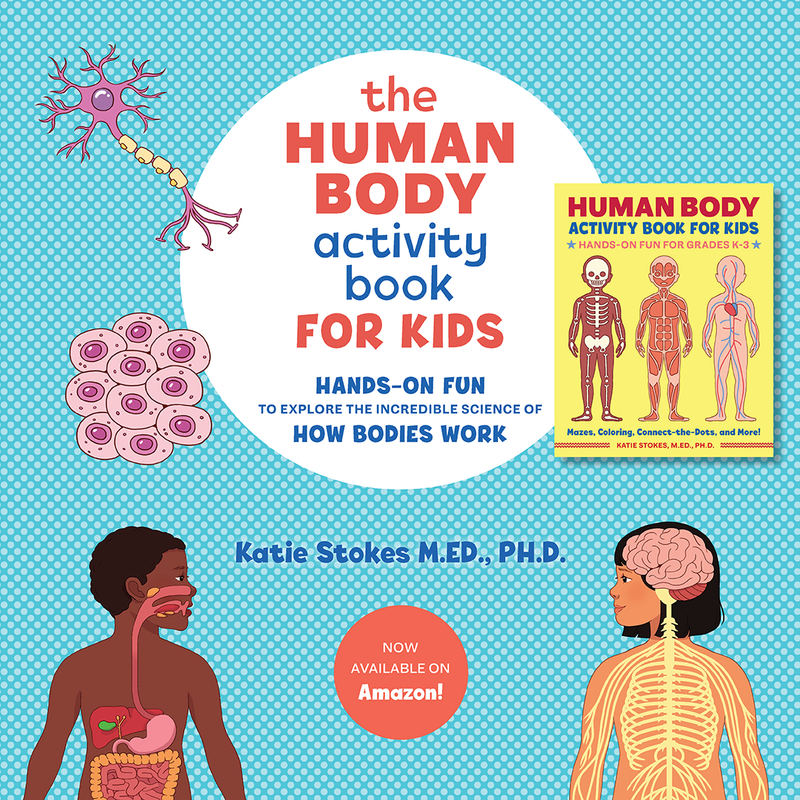 Thank you for the great activities and ideas!